The Pianocade is SOLD OUT. There are currently no plans for a second production run. Read this for more information. With synthesis hardware based off of classic gaming systems and a 128-note range, the Pianocade lets you perform the retro sounds you want, live! With traditional 5-pin MIDI and USB MIDI, you can use the Pianocade to control other instruments, or use external sequencers and controllers to play the Pianocade. Program the the sounds, customize the controls, decorate the case, hack the electronics. Make your Pianocade your Pianocade! All of the Pianocade hardware, firmware, and software is open source and designed for easy hackability. If you're really ambitious, build your own! While I'd love to make more Pianocades, between my family and my full-time job it isn't feasible to run a manufacturing business on the side. (If you're interested, you can read about some of the issues I had in the initial run in this blog post.) Trust me, I've tried to figure out a way to make a second run work, but I can't escape the fact that there aren't enough hours in the day for me to do it properly. @PortmanteauDev, for all products I might work on (including the Pianocade). @JGuberman, my personal account, for whatever I might be up to. You could also read/follow my project blog, Up, not north, where I write about all of my projects, whether intended for commercialization or not. I also really do love to hear from you, so please don't hesitate to get in touch via any of the above Twitter accounts, by filling in the Pianocade survey, or by emailing info@pianocade.com. The Pianocade's built-in synthesizer is based on the sound hardware of the Nintendo NES and Game Boy (specifically, one of the square wave channels: it's a monophonic square-wave synthesis engine with a 4-bit digital-to-analogue converter). Because it's monophonic, it does what many early games did in lieu of chords: it cycles through the notes of the chord rapidly (arpeggiation). Using a simple programming language users can customize the Pianocade's 15 sound banks over USB or MIDI. As the sound plays users can modify the sound's volume, pitch, and duty cycle, plus add on-release effects and modify parameters based on MIDI input (such as note velocity or aftertouch). Arpeggio order and speed can also be set individually for each sound. 128-note range — over 10 octaves! 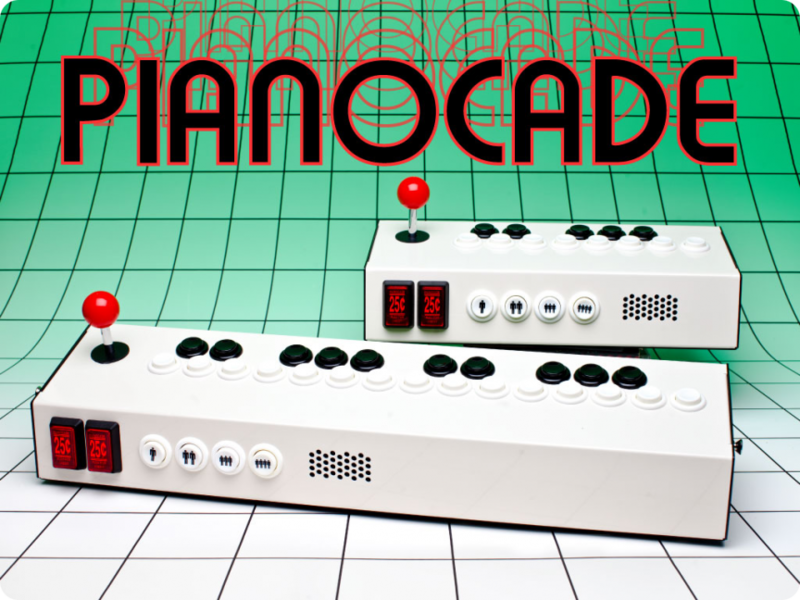 The Pianocade has traditional 5-pin MIDI ports (in, out, and through) as well as USB MIDI. Use the Pianocade to control any device with MIDI in (realistic instrument patches sound great with the arpeggiated chords! ), or control the Pianocade via an external controller or sequencer. The Piancade's arpeggiator automatically syncs with incoming MIDI clock signals too! 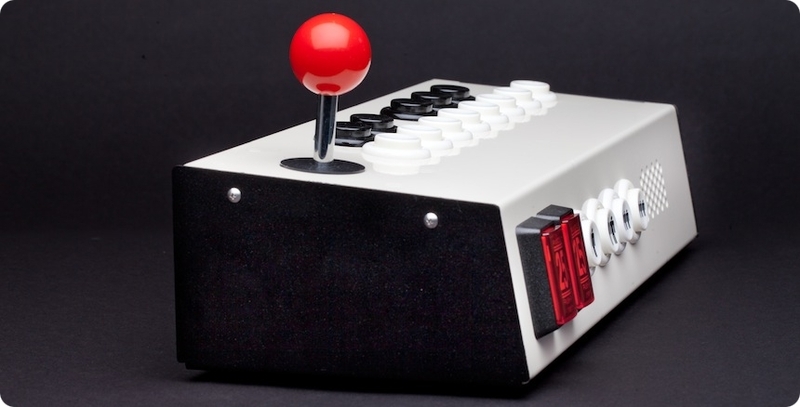 Reprogram the MIDI messages of the joystick, coin buttons, and player buttons for a totally custom MIDI controller. The Pianocade's synthesizer is incredibly flexible. It's easy to create awesome sounds and to share them online. All of the button and joystick settings can also be changed to create your dream MIDI controller. Because the Pianocade is completely open source. Want to modify the circuit board? Create custom firmware? Have at it! We've tried to make it easy by breaking out all of the microcontroller pins on the PCB. If that sort of thing interests you, then you can buy the electronics on their own, without the case or buttons. Share your mods with other Pianocade owners too! The Pianocade case is a blank canvas waiting for your personal touch. We start you off with some awesome logo stickers, but feel free to go wild. Want to design your own button overlays or side art? We'll give you the templates. In the future we hope to offer some awesome "artist edition" inserts you can use too! At Portmanteau Devices we believe strongly in the open source movement. As a result, all of our hardware, firmware, and software is completely open source. The most recent versions can be found on the Pianocade GitHub page. Anyone is free to hack a Pianocade or build one from scratch (although we've tried to price it so that it makes more sense to buy directly from us). The circuit board is designed to facilitate hacking: all of the pins of the PCB are broken out and labelled for easy access. An electronics-only option is also available for people who are more interested in tinkering than in a ready-to-play product. The Pianocade exists thanks to Toronto's amazing communities: hackerspaces like Site 3, community groups like The Hand Eye Society, and interdisciplinary initiatives like TIFF Nexus. It was directly inspired by the chiptunes night at the 2011 Nuit Blanche. We make our best effort to give back to the community by using local suppliers whenever possible. To that end, the Pianocade enclosure manufacturing, circuit board assembly, final assembly, and testing are all done in the Toronto area. In this way we can be sure that working conditions are good, wages are fair, and shipments of parts around the world are reduced. By popular demand: strap mounts, so you can use it as a keytar! Don't see your question? Contact us at info@pianocade.com! Will there be more Pianocades available at some point? Probably not. Manufacturing the Pianocade was a learning experience (and if you'd like more information about that, please read this blog post), but I'm not sure that I could make it economically feasible to do again. There would need to be significant changes to the entire process, and I don't know if there's sufficient demand to make it worth the effort. If you'd like to convince me that the demand exists, please feel free to fill out this survey. Pianocade is a trademark of Portmanteau Devices, Incorporated. All content copyright 2012.